I'm squeezing in one more fall project before I officially declare it Christmas season and start working on a Christmas quilt. It was an easy call since I can't decide what Christmas project to start, piecing 4 Christmas tops already this year has used up my Christmas fabric, patterns and mojo. So for now I'm working on Candy Box by Lella Boutique. 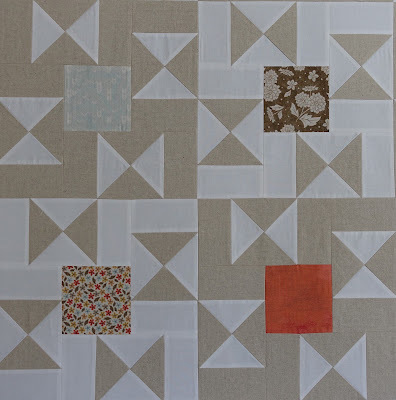 I blogged about this pattern earlier, I love the simple design and its pop of color. And those centers are charm pack friendly, or a great use of some scraps, or some random fabric you just don't know what to do with. 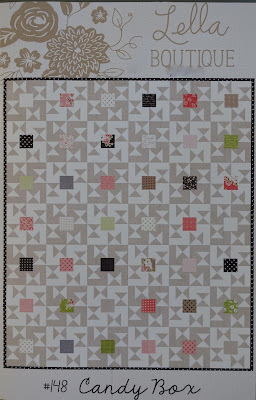 I'm using Persimmon by Basic Grey for Moda for my centers. The white it Bella Solid 0098 and the beige is Essex Linen, Natural. 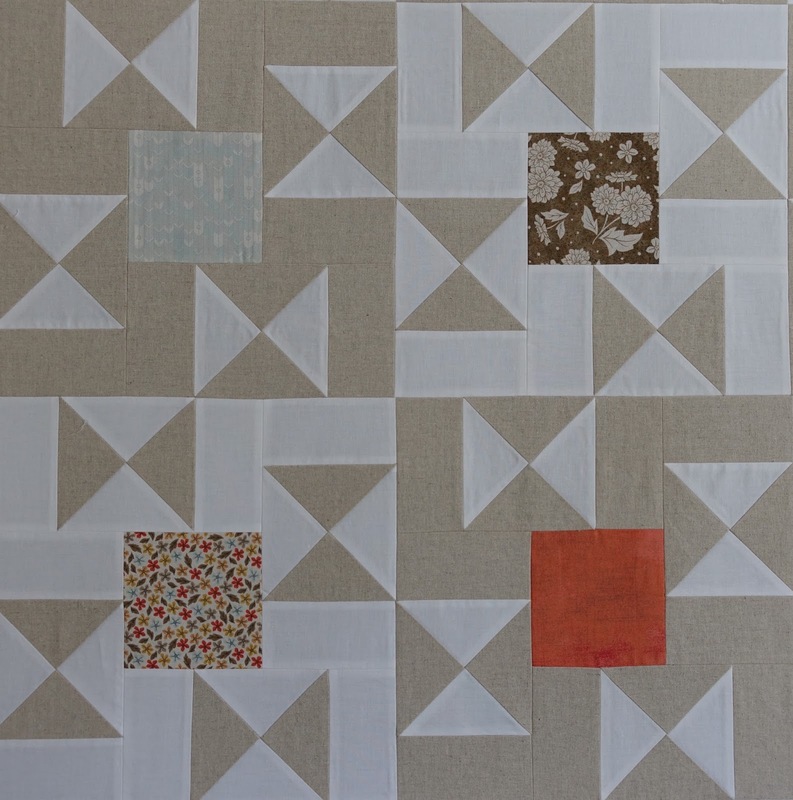 The quarter square triangles are easy to piece and I'm finding this palette calming. On another topic entirely, do you pay attention to the Blog List on the side of my blog? There have been some great posts lately that you should check out if you've not done so already. First off, Cindy Lammon of Hyacinth Quilt Designs just finished a beautiful Quick Curve Ruler pattern using Little Ruby that's a stunner. If you've seen it already, I think it's worth another peek. Lisa Bongean from Primitive Gatherings is hosting a free Magic of Christmas sew-along. I think 13 six inch block patterns have been released so far. I've not made a one, but have printed off each pattern with the hopes that I will. 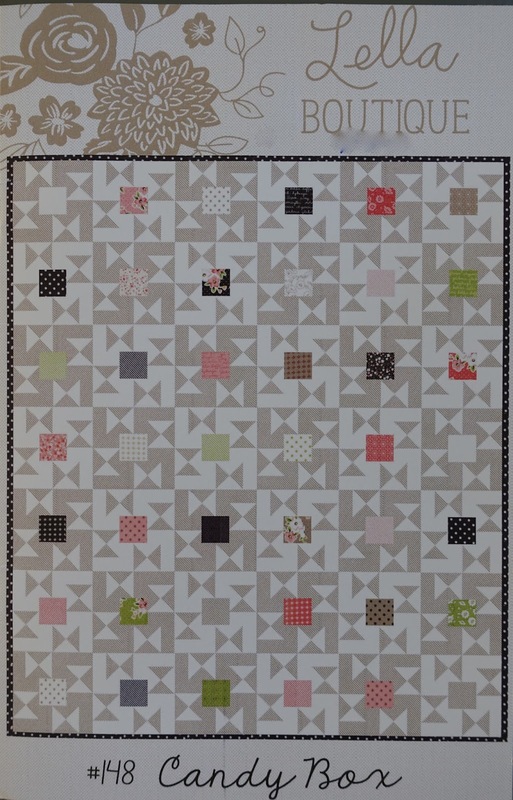 Nicole at Sister's Choice Quilts is sewing along and adding her own blocks, be sure to follow her progress. I already do a few of her suggestions but there were some new ones that I plan to start incorporating into my routine. I'm not as good as planning as I could be. I'm usually figuring out my next project while working on my current one. Next year I hope to improve on that. One tip that Sherri didn't mention that I do every sewing day is to have a set amount of time before I start working on my project to do some cleaning, organizing, filing or fabric sorting. Before I quit for each day I leave that cute little ice-cream cone timer on my sewing machine. It's my reminder to spend some time organizing the next time I'm back. I usually set it for 15 minutes, and you would be shocked how much you can accomplish in 15 minute increments. If I ever post pictures of my sewing room I usually get some comments on how neat the room looks, that's because I spend just a little bit of time organizing each day. Yes, I do love the list of blogs you follow. Yours is the first I check, then see if anyone in the sidebar has new content. Loving your new project. It must have Y seams. Difficult? Great eye! No Y seams, but one partial seam, that is no problem at all! Don't let that stop you from making this pattern, it is very easy. HONEST!! Another great pattern - I like the subtle colors. I try to stay organized and don't like having stuff everywhere! For the most part, I keep things pretty tidy as I go. As far as business goes, all e-mails get answered within a day (usually within an hour). I take care of things right away as they come, otherwise they have a tendency to be forgotten as new orders/questions, etc arise. Did you use your normal startching technique for the Essex? I have used essex and like it, but often wondered if I needed to widen my seam allowance. I DO pay attention to your blog roll! Your blog is my first stop every day, then I click thru to many on the side bar. Great post, Thelma! Yes, I do pay attention to your blog roll and have for years! It was you that introduced me to many of my very favorite blogs!!! I loved Sherri's post about time management and your tips were great too. Thanks so much! Yes this was a. Great post from Sherri, I think doing some tidying each day is a great way to keep organised. Love your blog and check in most days. How do you like working with the Essex Linen? I've never used it but have some in my stash. I've heard it frays terribly. I had planned on using it on some smaller projects. A dear friend gave me some linen-ish fabric, which is at least similar to what this "Essex" is; so, I would be interested in how it performs, does it need to be pre washed (please say no). Yes, I have some wonderful friends. I Love a Good Pumpkin . . . .